Target is offering a $10 off a Board Game Purchase of $30 Coupon valid until 3/28! Here’s an ALL coupon available to Print. 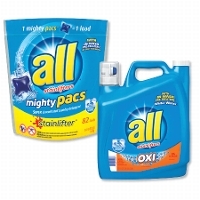 Print and Save $2.00 off All Laundry Detergent (172 oz) or Mighty Pacs (82 Count) Coupon! Just follow the link above and click the “Select to Print” button, then complete the steps to print the coupon. 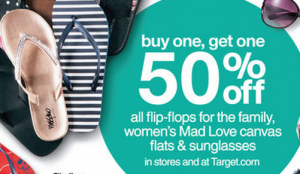 Women’s Flip Flops $1.61 at Target! Target is offering a 15% off shoes Target Coupon! Final Price: $3.22 or $1.61 each pair! Here’s a Lean Cuisine Target coupon! 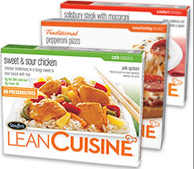 Print and Save $2.00 off 10 Lean Cuisine Target coupon! Just follow the link above to head over to Lean Cuisine’s Facebook page then fill out the form to get the coupon. 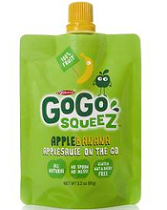 Purchase GoGo Squeez Pouches For $0.04 at Walmart and Target! Print this $0.75 off ANY GoGo SqueeZ Product Printable Coupon and get GoGo SqueeZ Product for $0.04 at Walmart and Target after coupon. Just follow the link above and clip the $0.75 off ANY GoGo SqueeZ Product Printable Coupon then click the “Print Coupons” button.